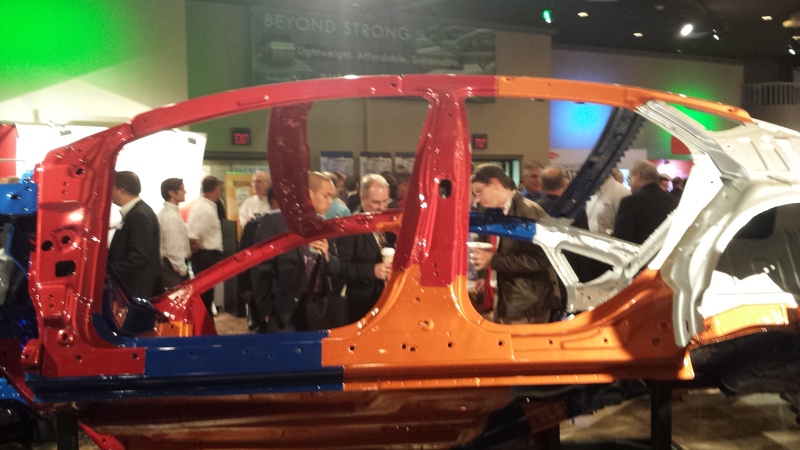 Though it wasn’t as forthcoming as the other automakers on display, FCA did release some specs and a color-coded body-in-white diagram of the high-strength-steel-intensive 2015 Chrysler 200 last week at the 2015 Great Designs in Steel conference. 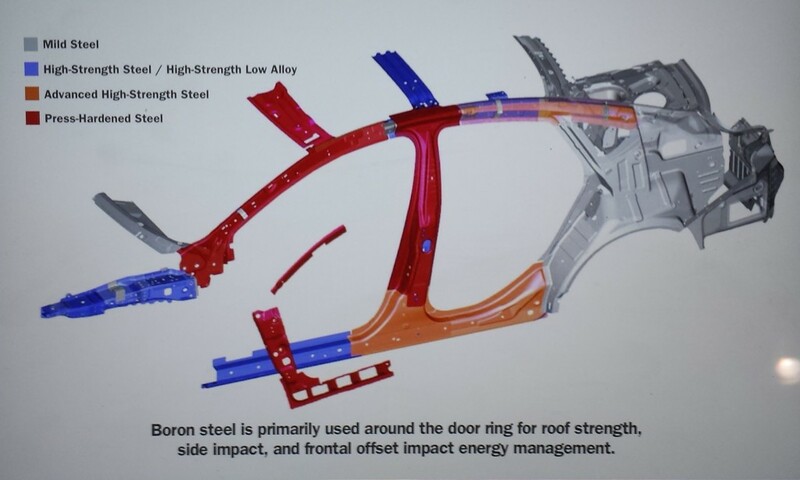 The bare-bones high-strength steel range (roughly 300-550 MPa) was used for another 27 percent of the body-in-white, and advanced high-strength steels, which are about 550-780 MPa, made up 30 percent of the structure. 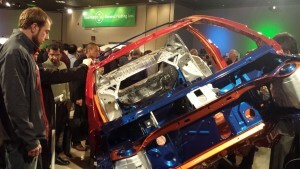 Ultra-high-strength steels, considered typically to be anything above 780 MPa, were only 1 percent of the structure, but hot-stamped steel — which gets into the 1,000 MPa and above range was 9 percent of the vehicle. 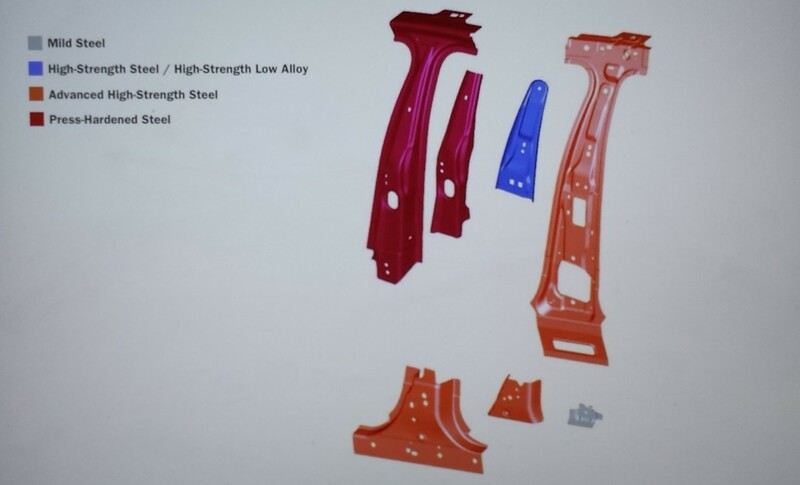 For comparison, there was only an average of about 13.8 percent high-strength or stronger steel in an entire vehicle in 2007, according to Ducker Worldwide data. The following diagrams show where the various steels are used. Press-hardened steel, which refers to the hot-stamped steel, can be found on the A-pillar and door ring, the B-pillar, and roof header, while advanced high-strength steel is also visible on the roof rail, B-pillar and rocker panels. The colors transfer to the physical color-coded body-in-white on display at the event. However, the 2015 200 did receive a five-star overall National Highway Traffic Safety Administration rating and is an Insurance Institute for Highway Safety Top Safety Pick+ with optional crash prevention equipment. The 2014 model didn’t fare as well. Those benefits are likely because of the tougher steels used in its design.